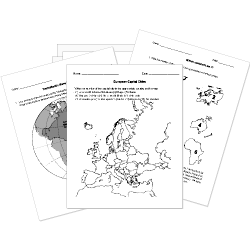 You can create printable tests and worksheets from these Grade 6 African Geography questions! Select one or more questions using the checkboxes above each question. Then click the add selected questions to a test button before moving to another page. What body of water is located on the west coast of Africa? Which river runs through the Sahara? What is the barren grasslands that lie between the savanna and the deserts? If you look at the Nile River from above, what does it look like? Animals that can store water, like tortoises and camels, can survive in the semiarid region? Africa contains countries in all. Tropical rainforests cover eight percent of Africa and are located primarily along the equator in West Africa? Deserts cover nearly 30 percent of Africa.